View More In Numeric Keypads. 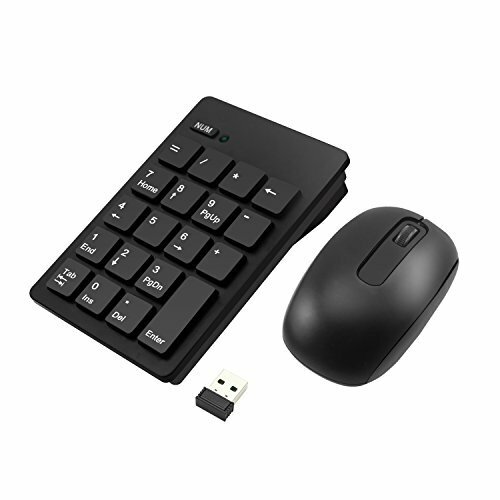 Alcey 19 Keys Wireless Numeric Keypad and Mouse Combo is a perfect accessory to complete your workspace. Just need to insert the receiver to the device's USB interface, perfectly creating a dedicated space for numeric data entry. Using the Number Pad, you will find your work efficiency and productivity will be improved greatly! Plug and Play: Just plug the receiver into the USB port, no device drivers required. Portable: Ergonomic design, thin and compact Mini Number pad can be put in a laptop bag or briefcase for efficiently entering data wherever you go. Convenient to carry and store. Power-saving design: When the keypad does not take any action about 2 seconds into hibernation, press any KEY. Long key life: More than 10 million strokes times. Power-Save function: when no any click or scroll or moving, your mouse will come to sleep state for the economize after about 8 seconds, for the wake up, you can scroll the wheel or click any button for this. Optical tracking engine, no moving parts. 1200 DPI optical precision switchable. Full-Size 19 Keys Keypad: Professional 19 full-size and concave keys design for this wireless numeric keypad, up to 10 million strokes times. Compared to ordinary keypad, it supports NumLock, Tab, Delete etc. Easy to use: Using 2.4 GHz Wireless technology, plug and play, no device drivers, signal transmission stability, almost no delay, the maximum working range up to 32.8FT. Power-saving design: Power Supply by 1* AAA Battery and 1* AA Battery【not include】; It enters into sleep mode automatically, no power button needed, extend battery life; Any key to awake up the keypad. If you have any questions about this product by Alcey, contact us by completing and submitting the form below. If you are looking for a specif part number, please include it with your message.